Do you offer mobile service? Yes. Kryger will come to you to replace any auto glass, including windows, windshields, side mirrors and rearview mirrors. What are the store hours? All of our shops are open Monday – Friday, 8AM – 5PM. We do have a few shops that are open Saturdays; check your shop’s hours now. Do you offer a warranty? Yes, we offer a warranty on defects and workmanship for many of our glass products. Learn more about our warranties now! What certifications do your technicians have? All of our techs are certified by our adhesive manufacturer, which is expected for a high-quality auto glass installation company. Our techs aren’t ready for the field until they’ve completed extensive one-on-one field training and are given the go by our veteran staff. Get to know the staff at a Kryger location near you. Who do I call if I have a problem with service or results? Kryger glass has focused on quality and safety since 1947 – and we take it seriously if something is wrong. Please call, or email us so we can work through this together. Will Kryger move the stickers from my old windshield to my new one? Of course, but there are certain stickers that cannot be transferred by law. Those we can’t move – but we’ll take care of the rest! Will Kryger re-install my rearview mirror on the new windshield? Yep! Re-installing your rearview mirror onto the new windshield is just part of the quality Kryger windshield installation service. How long does it take to replace my windshield? To replace your windshield, we need around an hour and a half to do the job. Same goes for just about any piece of auto glass. But then your car needs a break, and to remain immobile for about another hour. So all-in-all, it takes a little over 2 hours to complete the job. How long does it take to repair my windshield? Repairs are done in a snap, taking only about 20 minutes to do the job. The glue sets immediately, so you won’t have to wait to take your car for a spin. Is the chip smaller than a quarter? Is the damage located away from the edge of the windshield? Is the crack or chip only within the first layer of glass? Is the glass still intact where the chip occurred? Is the blemish out of the driver's line of sight? To learn more about why you need to fix that chip, check out how windshield repair works now! How long will my car remain immobile after my auto glass has been replaced? In most cases, you can drive away about an hour after service has been completed. Will I have to stay with my vehicle while it’s being worked on? Our technician will just need access to the interior of your car, as well as a key to turn on the electrical system and run some tests. When they’re done, they will call you to come back. Will the chip or crack in my windshield go away once you repair it? Unfortunately, no. Fixing chips or cracks in your windshield is not just about how it looks – it’s more about how the windshield performs. So our main focus is to make sure the chip or crack doesn’t get worse. Sometimes the type of chip, how long it’s been damaged, the location and size all determine how visible it is after repair.But we can guarantee your satisfaction. If you aren’t happy with the repair, we’ll deduct the cost of the repair towards a new windshield. Will you still come to me for mobile work in bad weather? We can’t do installations in bad weather simply because it won’t allow us to install your windshield properly. Debris, moisture, and cold weather can prevent the adhesion of your windshield, which means it will eventually fail down the road. We just can’t sacrifice your safety. What forms of payment do you accept? Pretty much anything except barter. We’ll take cash, debit cards, MasterCard, Visa, Discover, and American Express. Do I contact my insurance company or Kryger first? Get in touch with us first. It may actually be more cost effective to pay for your windshield replacement out of pocket rather than filing a claim. In most cases, if your insurance deductible is $500 or more, you won’t file an insurance claim. Will filing a claim raise my insurance premium? Possibly. Each insurance company is different, so make sure you talk to your agent prior to filing. But it’s important to note: Call your actual local insurance agent. If you call a national call center to verify coverage, this can actually have the same impact as making a claim. Is my windshield just as strong as a new windshield after having the damage repaired? Unfortunately, no. 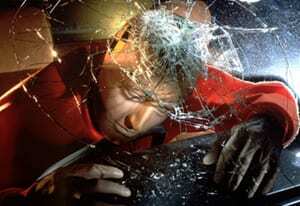 A damaged windshield will always be damaged, and it just won’t be as strong as an undamaged one. The point of repairing your windshield is to prevent the chip or crack from spreading and make it easier to see out of. How long before I can wash my car after getting a new windshield? Don’t get it washed with a high pressure system for at least 24 hours after installation. You can wash it prior to that if you avoid the high pressure washes. Do you tint windows? Not at this time, but we can refer you to a few quality businesses who do. Will my new windshield have that dark tint band at the top? If you want it to. It’s called a “shaded” windshield and we can install that for you – or not. It’s up to you. Is your glass the same as what I had before? Kryger buys glass from all of the same major glass manufacturers around the world that the car companies buy from. But car makers use a ton of different types of glass – even on the same vehicle. Kryger only uses glass that has passed the rigorous Federal Motor Vehicle Safety Standards and Regulations tests..
Do I pay my deductible to you or to my insurance company? You’ll pay your deductible to Kryger. We accept cash, and major credit and debit cards as payment. Can I get a ride home when I drop off my vehicle? What about picking me up when it’s ready? We’ll do both. Just ask! What kind of adhesive do you use to install windshields? Our adhesive is the same top quality brand used in auto factories all over the world. Our professional technicians know how to apply the adhesive so well, it’s just as good as the original factory seal. Will you get rid of the broken glass in my car? To the best of our ability, yes. Sometimes a few tiny glass fragments may be missed but our technicians do their best to insure that your car is clean, and all broken glass has been removed prior to you getting back in your car. What causes rust around the edges of the windshield? A poor installation job. Fact is, a good deal on a windshield doesn’t always mean you are getting a good deal. Unprofessional or poorly trained technicians may cut corners or use poor adhesive. Make sure before you schedule an appointment that the installation process and materials are as good as they’re supposed to be. Does Kryger Glass do more than just auto glass? Most of our shops will be glad to take on residential glass needs like table top glass, mirror fabrication and storm window repair. Some shops will also take on small commercial jobs such as glazed windows.Get in touch with your local shop to find out all they have to offer. There’s tape on my vehicle. When can I take it off? Most of the time our techs will take off the tape before you even get your car back. Sometimes, though, we have to keep it on a bit longer to ensure everything sticks. If that is the case the tape should be removed in 12 hours.